It was one of those games where nothing went as per the plan for the Renegades. The Melbourne Renegades suffered a massive embarrassment in the 29th game of the Big Bash League (BBL). Their encounter against the Brisbane Heat proved to be a completely one-sided battle. Courtesy some outstanding batting from skipper Chris Lynn and veteran Brendon McCullum, Brisbane won the match by a massive 101 runs. This victory has taken the Heat slightly up on the points table. With three wins in seven games, they now stand at the sixth position and have also improved upon the Net Run Rate. With the ball, it was Mitchell Swepson and Brendan Doggett who starred with three wickets each in their account. Brisbane Heat, after being put into bat, got off the blocks quickly. Opener Max Bryant and Brendon McCullum added 70 runs in 6.4 overs before the former fell for 44 from 24 balls. Though, McCullum latter didn’t take his foot off the pedal and was joined by another fierce hitter in the form of Lynn. Both these men were absolutely brutal in their approach and tonked the bowlers all over the ground. They added 89 runs together for the second wicket before McCullum perished for 69 off 43 balls. Lynn hastened the run scoring rate towards the end of the innings. His unbeaten 44-ball 66 assisted his side to put up a massive total of 192 runs on the board. It is critical for any team to have a good start to the innings while chasing such a massive total. But, it wasn’t to be the case with the Renegades and they lost three wickets for just 25 runs. The ship sank further down when half of the side was back in the pavilion for 50 runs. They were further reduced to 52/7 and there seemed to be no scope of winning it from there. Cameron Boyce showed some resistance down the order scoring 25 off 21. Yet, his team was bowled out for 91 in 17.5 overs. Twitterati was exhilarated watching Brendon McCullum and Chris Lynn in the act together. They thoroughly enjoyed the show put up by these two smash hitters. Also, the bowlers were commended for the brilliant efforts which helped them get this massive win possible. Top three of Brisbane Heat. Max Bryant is going to be a great player for Australia across formats. Fearless and clean striker! 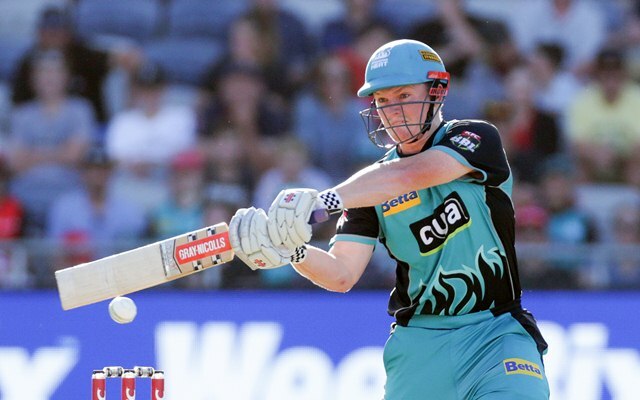 Get the latest Cricket News and updates from the Big Bash League, Match Predictions, Fantasy Cricket Tips and lots more on CricTracker.com.